I enjoyed this exciting mystery suspense mail-order bride romance. The book is part of the American Mail Order Bride series of 50 stories, one for each state, that all revolve around young women who work in a factory and then after a fire, desperation sets in, but redemption comes with becoming mail order brides. In Katie’s case, she was orphaned in 1880 when her parents and siblings died due to yellow fever and after living at the orphanage run by the Sisters, she then went to work at a factory. Katie Maverick responds to an ad from the Groom’s Gazette sent from Daniel O’Malley of Charlottesville, Virginia and he offers her marriage, and so she takes the train from Lawrence, Massachusetts to begin her new life and marriage. But there is one problem, Daniel was not the one to place the ad and offer marriage, it was his best friend and business partner, Frank. Daniel is upset and plans to send her back, but at the train platform, he sees Katie and decides that he will marry her. This marriage has so many secrets, unanswered questions, a death of a previous wife, and trouble with the vineyard, and no one will talk about what has and is happening. The plot keeps the reader in constant suspense as this mystery unfolds. The story has secrets, sabotage, murder, mystery, angst, and lots of doubts. The marriage between Katie and Daniel starts off rocky, with confusion, hurt, and has her questioning if she made the right decision. What is the truth surrounding the death of Eloise? Daniel didn’t tell Katie he has been married before and was a widower, and refuses to talk about his late wife, the only way she has learned this information is through other people. Daniel’s mother is a bitter woman and makes accusations towards Katie, yet she stays kind and upbeat. Who is reeking havoc and sabotaging the vineyard, trying to damage it and destroy the wine that is ready for market? Why is Frank trying to find buyers for the land? Will answers be found before Katie and Daniel’s marriage and livelihood is destroyed? 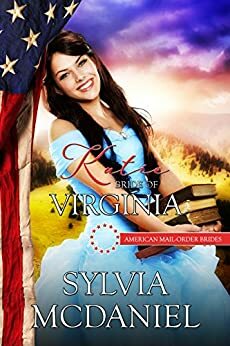 Sylvia McDaniel is a new to me author and I loved her story of Katie and Daniel in this American Mail Order Bride series. Katie needs a husband, a home, and a new life. She goes to Virginia as a mail order bride and finds a wonderful man and a lovely home but a cantankerous mother in law in need of love, and learning to forgive herself. There is of course romance, twists and turns and horrible things happening as life at the vineyard is trying to move forward. Suspicions about each other and so on. So much going on in the story I couldn't put it down. You won't be able to either. I highly recommend this story and it is a must read. Thank you Sylvia McDaniel for a wonderful story and now giving me another good author to want to read more of your stories. The good: very interesting story, with good elements; captures the attention. The not so good: writing is a bit clumsy at times. It really needs to be smoothed out. Sometimes seems inconsistent with the time period. Story doesn't always flow well. Characters are somewhat extreme in their reactions and reasoning, overly stubborn with their mistakes; it's not very realistic. Within a very short time, both hero and heroine oscillate between euphoria and despair regarding their relationship, and the chances of success of their marriage, without any major event prompting the change. Secondary characters are not fully fleshed out. Good ideas, good storyline but not well executed. The tenth book in the American Mail Order Bride series. A book of mystery and betrayal. The factory fire caused Katie to answer an ad for a mail order bride. Daniel didn't place the ad but his good friend did. Once she stepped off the train, Daniel knew he couldn't send her back. A gruff mother-in-law, and a secret mystery regarding her husband, leaves a lot of wondering and emotional times for Katie. She really is a strong woman. Will she overcome? Wow! This story had me in circles, I usually figure things out about a quarter of the way through a book, but I must say I thought I was stumped. Then when I thought who was behind it all, I was shocked to find my first impression was right all along. So I did figure it out after all, however I doubted myself. Next time I won't. This was an excellent story Sylvia, thank you, you are to be commended! Well done.